Watch video of the keynote panel discussion on the transformation of U.S. metro newspapers. Given the fall in advertising revenues in recent years, the large traditional media in the United States have found it necessary to pay closer attention to digital platforms as new outlets for reaching more audiences and, consequently, ensuring revenue. 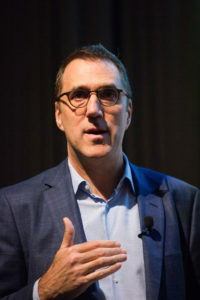 The panel was introduced by Mike Wilson, editor of The Dallas Morning News, who began following a presentation by Jay Bernhardt, Dean of Moody College of Communication at the University of Texas at Austin. 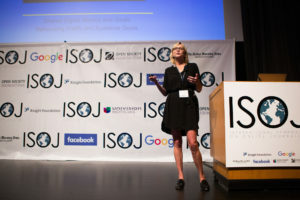 Kathleen Kingsbury, managing editor for digital at the Boston Globe, outlined the strategy the newspaper followed to become a digital newsroom This strategy consisted in essentially giving more importance to data journalism and making its platform more agile, without losing the journalistic narrative as the center of its actions. To increase interaction with its audience, The Globe resorted to the use of bots on Facebook Messenger, as well as a group with its subscribers in the same social network. They used it to establish direct communication with their readers. According to Kingsbury, the investment in the bots is only 10 dollars a month and the traffic generated is six times greater than that obtained with a Facebook post and 20 times better than a Tweet. The conversion of a traditional media outlet into a digital media outlet not only involves applying a strategy to its content, but also to the dynamics of its staff. 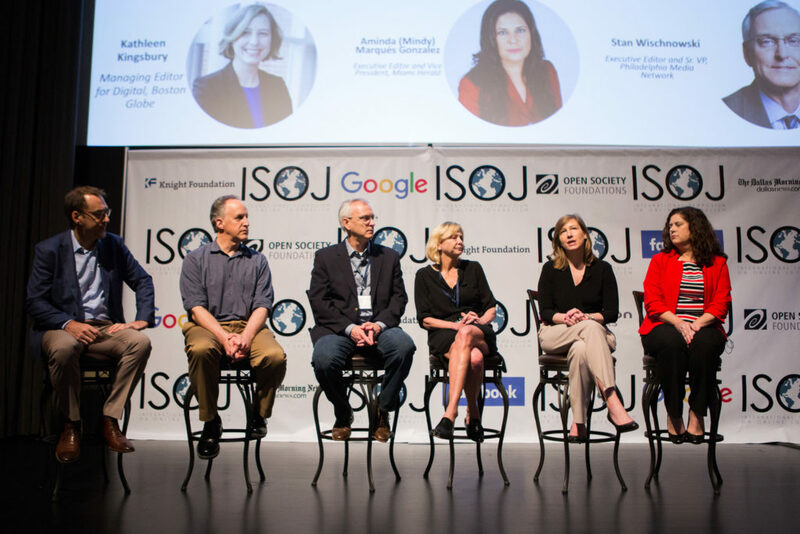 Stan Wischnowski, executive editor and senior vice president of the Philadelphia Media Network (PMN), shared with the ISOJ 2017 audience the reorganization of his company to align with new audiences. PMN’s strategy included re-arranging employees in positions where they truly add value to the company, an experimentation lab to generate story ideas and a physical restructuring of their facilities into an audience-driven digital newsroom. In addition, the nonprofit team is receiving training on the use of new technologies by the City University of New York. “Our journalists are learning everything from data journalism to visual storytelling, to how to use social networks more effectively”, he said. Wischnowski highlighted the importance of partnering with other organizations and external experts in their effort to become a model of innovation among non-profit media. The Houston Chronicle was also in need of a change in its strategy to streamline its digital processes. Nancy Barnes, editor and executive vice president of the newspaper, explained how it modified the strategy focused on two sites: one free and focused on the millennial digital public (www.chron.com) and the other with serious journalistic work that is behind a paywall (www.houstonchronicle.com ). It provoked a “cultural war” in the newsroom. With the new strategy at the Chronicle, reporters will be trained on audience metrics and engagement tools, and will be motivated to produce stories that make sense to them and to work as a single team, regardless of the channel on which their work is published. The editor explained that they will use their free site as a funnel to direct readers to the pay site with compelling content that will lead them to become subscribers. “Growing digital subscriptions is a major goal for every news organization in America because people are giving up print, but we still need their consumer revenue and we need them to subscribe to our digital products,” Barnes said. The editors are aware that not only readers are leaving print media. So are the advertisers. During his presentation, Neil Chase, executive editor of The Mercury News and East Bay Times, told how he applied his multi-year marketing experience when he took over the newspaper. Chase implemented a strategy that included turning journalists into managers of digital products, managing the media as the business they are in economic terms, and building a unique relationship with advertisers and helping them to tell the stories they need to communicate to the public instead of just selling them banners. “We have to learn from everybody, collect that information as quick as we can and share the stuff, get the newsroom and the editorial side thinking about products and why do we do them, look around and think ‘what are we good at?’,” Chase said. The relationship with the community is also an important factor in the digital conversion of traditional media. To do this, Chase shared that his media outlet made alliance with the social network Nextdoor to bring their products to people at a more local level. “If we can turn into the kind of product machine that can build what the community wants, get the newspaper back to being what it used to be -the most important way people connect with their neighbors-, I think we have a decent chance of getting where we need to go,” he finished. Mindy Marqués, executive editor and vice president of the Miami Herald, explained how video has contributed to the consolidation of the newspaper in the digital terrain. Marqués described the actions that have led them to increase video traffic by 200 percent in their digital site without having to make large investments. Instead of hiring videographers and boosting the production of its own material, the Herald’s audiovisual equipment uses aggregation. The newspaper reproduces and shares viral videos from social networks, security cameras and animal or novelty clips that ensure significant traffic. “We look for that, what is viral or is going to get viral. The thing I would say is really key is when you find a great video and write a story to go with the video,” Marqués said. The journalist mentioned that among her best practices is to add videos to all stories, even if they are not about the story itself, which enhances the amount of traffic that both the story and the video receive. “We really just used these ideas from the talent in the room, we let them do what they do and we have seen really great results,” she said. The panel was closed by Mike Wilson, who spoke about what they have done at The Dallas Morning News to retain the new audience they have managed to capture after the conversion of their newsroom and reporters to a more digital journalism approach. Wilson commented that the Texan newspaper began by assuming itself as a website and not just as a newspaper. Once they succeeded in increasing their audience, they began to give priority to factors such as engaging with that audience, increasing the number of returning readers, and increasing their interaction in social networks. The journalist pointed out that due to society’s skepticism and distrust of towards the media, his priority now is to show his readers his new philosophy of work. Like the Philadelphia Media Network, the Dallas Morning News reorganized its staff so that 50 percent of its employees were relocated to positions they felt were better at contributing to the newspaper’s new mission. He also added specialists in data, digital design, video and audience engagement. To watch video of this panel and all others at ISOJ, visit Facebook or YouTube. Video will be posted to isoj.org shortly.